After a great 2012 in the pipeline business, Plains All American Pipeline, L.P. (PAA) completed a transaction to increase the focus on rail transportation growth. The company finalized a $500M deal to acquire several loading facilities for railroads though the existing enterprise value of nearly $22B limits the impact of this rail move. Plains All American engages in the transportation, storage, terminalling, and marketing of crude oil, refined products, and liquid petroleum gas (LPG) products in the United States and Canada. The move highlights the transformational currents under cutting the pipeline business. As crude oil has been unable to transverse the current pipeline system to reach the refineries on the coasts, the railroads have stepped up with more direct routes that bypass the congested Cushing, OK oil hub. Not only is it a boon to railroads struggling with weak coal shipments, but exploration and refinery companies are access to better pricing than currently available. Accenture: Is The Stock Run Over As The buybacks Stall? The stock of Accenture Ltd. (ACN) has had a great run over the last couple of years as the company has grown earnings and repurchased shares. As the stock has nearly doubled, the buybacks have stalled leaving the company with less bang for the investment. As one of the world's leading management consulting, technology services and outsourcing organizations has seen earnings nearly double in the last few years, the stock has seen strong gains. The company, though, hasn't been able to increase the buyback amount and in fact spent less in fiscal year 2012 versus 2011. All signs that the insiders with the best information might consider the stock price expensive. 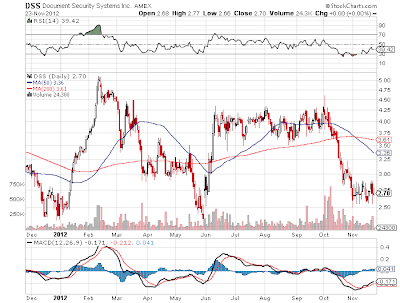 After a great 2011 and facing a promising finish to 2012, Oneok Partners, L.P. (OKS) has fallen out of favor since the start of November. First, the company provided disappointing commentary on the Q3 earnings call. Second, it announced the decision to not move forward with a Bakken pipeline. The combination turned the market away from this previously hot stock. The company is one of the largest traded MLPs and a leader in gathering, processing, storage, and transportation of natural gas. ONEOK, Inc. (OKE) owns 42.8% of the equity interest. The stock has plunged from over $60 in early November to just below $53 today. In fact, the stock is now down for the year and approaching a total return near flat. 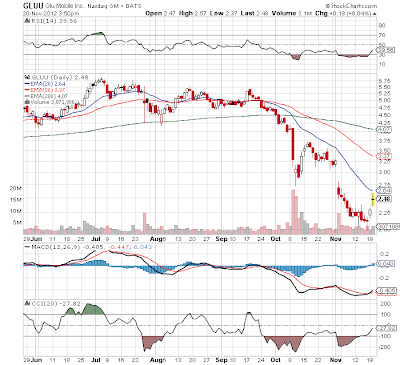 Is it time to buy the stock now or are investors realizing that pipeline MLPs aren't free money? Read the full article on Seeking Alpha. The article is classified as PRO and will only be available for viewing for 30 days from 12/17/12. This model was up 0.01% in November versus a 0.3% gain for the benchmark S&P 500. The model slightly under performed the market in November, which can happen in solidly positive months. As of the end of November, the model was up nearly 20% for the year compared to 12.5% for the S&P 500. In general, the model had a very uneventful month with flat returns and no trades. Bottom Performers While the model was flat for the month, several stocks had meaningful moves in November. 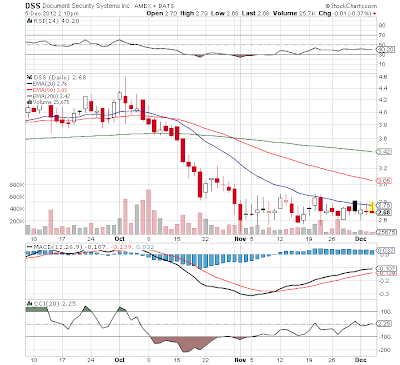 The weakest stocks were Kohl’s Corporation (KSS), WellPoint, Inc. (WLP) and Entergy Corporation (ETR). Kohl’s lost nearly 16% due to a weak earnings report at the end of the month. The stock plunged from nearly $51 to below $46 on disappointing sales. The company continues a large buyback and should be able to load up on shares at these attractive levels. With the SolarCity Corp (SCTY) IPO last week, investors got another reminder of the time demands of Tesla Motors (TSLA) CEO Elon Musk. Not only is he busy attempting to make Tesla into a force in the auto sector, but also he is busy launching rockets to Mars via SpaceX and now prominently involved with another public company. If anything highlighted the issues with his time, it had to be the IPO interview on CNBC. In general, it is odd for the chairman to be involved in the post-IPO interview. On top of that, the interviewers kept attempting to steer the questions towards Tesla. That isn't necessarily the fault of Musk, but it does highlight the issues that the stock market will place on his priorities now that he runs two public companies. After the market close on Wednesday, Cerner Corporation (CERN) announced a $170M stock buyback. The stock was up slightly in after-hours based on the news, but shareholders should absolutely ignore this supposedly good news. A leading supplier of healthcare information technology had a buyback plan since 2008 that has had little use or impact. More importantly, the company announced that the plan would only encapsulate 2.1M shares, or 1.2% of the company's shares outstanding. Why does the company even bother at that level? On top of that, why does the CEO claim that the buyback program is a good use of funds with the stock trading at 28x forward earnings? The stock trades above the expected growth rates suggesting limited value. Anybody following this blog knows that Stone Fox Capital has been negative on Tesla Motors (TSLA) because the CEO, Elon Musk, is actively involved in multiple firms. In what is seen as his 3rd firm, SolarCity (SCTY) debuted to on the Nasdaq. The CNBC interview this morning highlights the issue with him so focused on other firms. As only Chairman, it's odd for him to be interviewed along with the CEO. Typically its the CFO if anybody that shows up on tv. Note how the conversation goes directly towards Tesla when the CEO can't hear the interviewers. Just the confusion on this interview highlights the risks in these stocks. Elon is clearly highly involved with this firm along with SpaceX. As the CEO of Tesla, he should be spending all of his time on that firm. The guy is obviously brilliant, but his competition is completely focused on one company and sector. After the market close on Tuesday, Cummins Inc. (CMI) announced an additional $1B stock buyback. The stock was up roughly 1% in after-hours based on the news, but shareholders should ignore this supposedly good news. The manufacturer of diesel engines has historically bought its own stock over the last 5 plus years so investors should not be surprised by such a move. The company continues to make strong profits so the lack of an additional buyback program would be more abnormal. More importantly, the company approved the buyback program as the last $1B approval in February 2011 comes to a close. Effectively the company has taken nearly 2 years to complete a buyback that amounts to 5% of the outstanding shares or market value. Over 2 years, the buyback will only amount to roughly 2.5% of the outstanding shares each year. In a matter of a few months, Facebook (FB) has gone from a bumbling internet behemoth to a tech darling. Now prior to market open on Wednesday, the tech giant will be added to the NASDAQ-100 Index according to the news release by NASDAQ OMX Group (NDAQ). An event easily predicted, but another example that has added to the momentum for the stock. The stock has jumped 50% since mid-November when it traded around $19. At the current price of nearly $28, the company trades at extreme valuations that could finally help the short thesis. As a firm hoping to short Facebook stock (see articles here), the NASDAQ-100 event could be a signal of a top. Plenty of funds will be forced to buy the stock, hopefully pushing it to near-term highs. An important question is whether being adding to the index signaled past tops? Similar to how the stock lockup that created potential added sales actually produced the November bottom and the ensuing rally. Last week, Freeport-McMoRan Copper & Gold Inc. (FCX) announced monumental mergers that sent the stock plunging 20% over the next two trading days. While the deals appear attractively priced compared to the assets obtained, the market clearly doesn't appreciate complex investments in the current environment. For those investors living under a rock, the company agreed to purchase both Plains Exploration & Production Company (PXP) and McMoRan Exploration (MMR). Since both of these companies focus on oil and gas exploration, the purity of being a strictly copper focused producer attracted plenty of investors that might disappear now. Below are two charts highlighting the monthly returns of the top 10 stocks from November (see original list here). Due to limitations with YCharts, the chart was broken into the Top 5 and Next 5 lists. Disclosure: Long AMP, COP, DTV, GS, KSS, MSI, NLY, WLP. Please review the disclaimer page for more details. Through April of this year, Baidu, Inc. (BIDU) was one of the hottest tech properties in the investment world. The stock of the leading Chinese language internet search provider reached close to all time highs around $150 and a market value of $55B. Now the stock appears to be falling off the China cliff. Not only is the stock facing less and less investor appetite for Chinese stocks, but now the fears are growing that all Chinese stocks face delisting possibilities due to audit issues. While the S&P 500 remained close to recent highs on Wednesday, Baidu again plunged to a new 52 week low. Other issues continue to pop up over the conversion to mobile reducing the click through rate (CTR) and more competition from Qihoo 360 Technology (QIHU). All of these issues have pushed the stock down to a very cheap valuation with a PEG near 0.5. In the past, we have been very critical of the IPO process. In 2011, the Chinese technology firms soared 100% above the IPO range and left initial public investors with considerable losses in a few months. In 2012, the social media stocks blew up after investors in the public markets paid considerably above the IPO price. In both cases, the IPO process signaled the top in these hot sectors leaving the public holding the bag as the insiders exited the firms. Now GSV Capital Corp (GSVC) allows regular investors to participate in the potential insane gains of the IPO process. Instead of needing millions of investment capital, GSV allows investors to "hire" a management team to scout out the top private investments and diversify the risk via 40+ companies. Manitowoc Company Inc. (MTW) closed out last week trading at the 6-month high levels of $15. While the market envisions the company as a crane manufacturer that competes with Terex Corporation (TEX), it currently obtains higher operating income from the food service division. The company currently has a mark cap of $2B and only trades at 5x the trailing twelve months EBITDA of nearly $400M. With limited operating margins in the crane division, the company has yet to see any rebound from the global financial crisis. The company faces similar margin issues as Terex in comparison to a mega-cap like Caterpillar (CAT). In the last few months, a shift is occurring as stocks focused more on construction equipment have performed better than ones with mining exposure. Disclosure: Long MTW and TEX. Please review the disclaimer page for more details. With the market typically favoring dividend stocks over growth stocks, Splunk Inc. (SPLK) remains a conundrum trading at roughly 12x forward revenue estimates. While the company has huge growth potential, analysts only expect 35% growth next year that wouldn't normally warrant such a high valuation. The company provides a leading software platform for real-time operational intelligence. In essence, the company is leading the "Big Data" revolution by offering software tools for analyzing the incredible amount of data created on a daily basis. Back in the summer, the valuation didn't support the growth rate. After a sell-off in October, does the stock finally offer a good value? Back in mid-November, it appeared that Facebook (FB) was headed to the teens for good as investors became very pessimistic regarding the stock. Along came the much-expected massive stock lock-up on November 14th and the market was surprised to see the stock soar instead of plunging to new lows. Within weeks, the stock soared from a low around $19 to $26.15. An incredible 35% surge for a stock left for dead. A major reason for the leader in social media surging was three analysts increasing price target this week. What has made analysts so bullish on a stock that recently traded as low as $17 to only be upgraded once the stock hit $24? The stock remains a favorite short candidate of us, but our firm has been on the sidelines waiting for a better entry point after the market became too bearish based on the lock-up issues and the mobile monetization fears. See our previous articles here. Note the comments section has been full of warnings that the lock-up might trigger a bottom. McMoRan Exploration Co. (MMR) shares plunged on Monday after the company reported more mechanical issues with the hopefully prolific Davey Jones No. 1 well. Investors had expected results from this well over a year ago, but problems continue to frustrate all involved in this historic drilling effort. "People call us pioneers. Well, that's great, I guess, (though) some people say pioneers end up with arrows in their back."